The general purpose of the Stargazer program was to test the feasibility of doing astronomical research from a manned balloon borne vehicle. It was initiated in 1957 at the Smithsonian Astrophysical Observatory by the Air Force Office of Scientific Research. Later, the program was under the sponsorship of the Air Force Cambridge Research Laboratories and the scientific portion was conducted at Dearborn Observatory, Northwestern University under the guidance of Dr. Allen Hynek. In association with Dearborn Observatory, the Experimental Astronomy Laboratory of the Massachusetts Institute of Technology was responsible for the telescope mounting and stabilization system and the Naval Ordnance Test Station furnished a scientific assistant and technical assistance in the design and construction of the instruments. Finally, Wright-Patterson Air Force Base was responsible for the gondola and its fittings and the high altitude indoctrination of the observer and the R&D test branch of AFCRL was responsible for the balloon launch operation. The project included a total of five unmmaned test flights in 1962 and this the only one piloted flight. The balloon manufacturer was J.T Schjeldahl company from Minnesota and was made of reinforced mylar. It had 280 feet high, 200 feet diameter and 3.200.000 cuft of volume. In the balloon apex was located an electromechanical valve wich allowed the pilot to control the gas release. Also a servo controlled ballast hopper was available, carrying fine steel dust wich can be released as required to reduce the balloon system weight. Between the balloon and the gondola was a 100 foot diameter recovery parachute which was flown in an extended position throughout flight to facilitate nearly instantaneous opening in the event of a balloon failure or a pilot decision to descend in this manner. The gondola was hanging below the balloon on a cable giving a total height at takeoff of approximately 400 feet. The sealed gondola was an aluminum cylinder 13 feet high and 7 feet in diameter (picture). 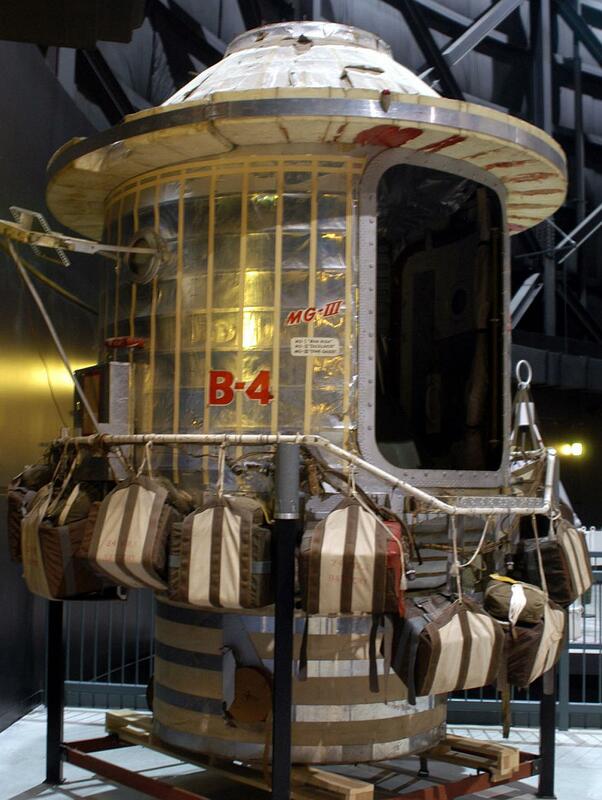 This gondola was originally designed as a platform for a high altitude escape program, for which purpose it was never used so modifications for Stargazer were started in 1958. In flight the gondola was pressurized to a equivalent one of a height of 22,000 feet. The occupants weared partial pressure suits and partial pressure helmets with the face plates open. The pilot had to operate the communications devices, the equipment necessary to control the balloon's flight, and other instrumentation. He also monitored and controled the environmental control and life support systems of the gondola, e,g. oxygen nitrogen, carbon dioxide, water vapor pressure, and the interior temperature. An ordinary aircraft altimeter gived readings in the normal range of aircraft to 50,000 feet. Above this, a special aneroid barometer indicated the altitude. Two way communication was maintained with the ground at all times. UHF radio was used for linking the balloon crew with the ground, with an alternate HF channel. Thermal control of the gondola was accomplished with a passive system wich combined exterior surface coatings and interior materials selected and adjusted for a workable balance in solar absorptivity and radiative infra-red heat emissivity. A dead air space was provided between two layers of aluminium foil outside the gondola for its insultaing effect at lower altitudes. Inside the gondola itself, aluminized fabric curtains were draped over the walls and also covered the overhead dome of the gondola. They purpose was to be a barrier against constant heat loss specially after the sunset. 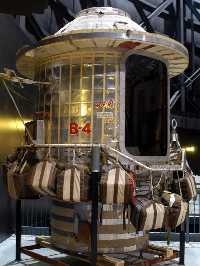 The design of the gondola door allowed, in an emergency, both pilot and observer to parachute from the gondola at an altitude of about 20,000 feet. The Oxygen-Nitrogen system furnished breathing oxygen for the crew, pressurization for the partial pressure suits (as required) and pressurization for the sealed gondola. Below the gondola floor were located two 10 liter liquid oxygen converters, and one 10 liter liquid nitrogen converter. The liquid nitrogen was forced through an evaporating coil by the build up pressure in the nitrogen converter, and the gas was then passed through a warming coil wich encircled the interior walls of the gondola. After warming up the gas to the gondola temperature, the nitrogen was metered by the pilot through a flowrater by means of a manual needle valve, and dumped directly into the sealed gondola. The control of CO2 and H2O vapor in the gondola was accomplished passively by chemicals without the expenditure of any power. CO2 was absorbed by Baralyme packed in multilayered screen trays located beneath the crew seats. Circulation of the ambient air over and through the layers of the screen trays was achieved by natural convection. 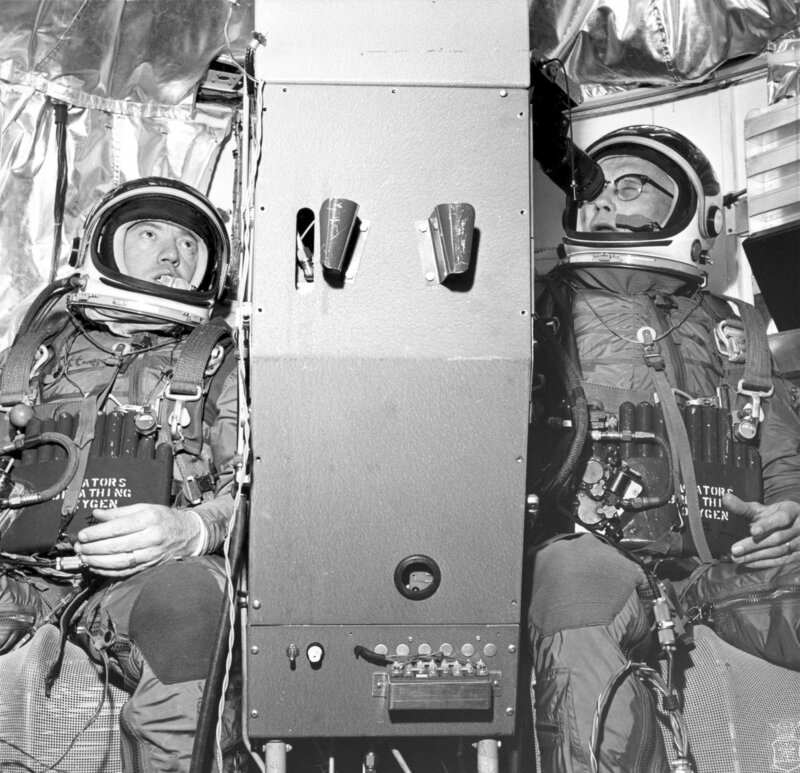 Both, pilot and scientific officer used a partial pressure suit model CSU4P with an integral ventilation suit and a modified HGU8P partial pressure helmet. In the normal mode, the suits were not pressurized and the face plates were open. Oxygen and nitrogen were metered manually through the flowmeters in a 50-50 mixture, maintaining a cabin internal pressure of 6 psia. If there was a cabin leak, the needle valves regulating the dual gas flow would be adjusted to compensate it, the face plates close automatically and the suits begin supplying oxygen to the wearers. At that time the barometric shuttle valve automatically diverts the oxygen flow downstream from the manual needle valve to the suit and helmet regulator valves. To monitoring the crew health two physiological parameters were closelly followed during the flight: a electrocardiograph picked up by biaxilliary electrodes, and the respiration rate picked up by a liquid copper sulfate respiration resistance transducer strapped across the chest of the aeronauts. These signals were telemetered to the chase plane by pulse position modulation. The key piece of scientific equipment consisted of a Cassegrain reflector telescope with a primary mirror of 12 inches in diameter and a effective focal length of approximately 120 inches. The Ferson Optical Company designed and built the secondary mirror support system wich by a combination of Invar and aluminum components held the focal point to within f 0.001 inch over a temperature range of -60°C to +70 ºC. The telescope was the first balloonborne instrument mounted in a platform with gyroscopic-electronic stabilizing gear. The system, developed and built by Massachusetts Institute of Technology's Instrumentation Laboratory, served two purposes. It stabilized the telescope, holding it steady with respect to the stars despite the swaying and spinning of the gondola, and provided an automatic means of maneuvering the telescope -mounted outside- so that it remained pointing at the stars they want to observe. The M.I.T, system included two single-degree-of-freedom gyroscope, and two single-axis star trackers mounted on the cylindrical frame which housed the Stargazer telescope. One gyro and one star tracker were mounted to sense traverse, or slide to side, motion of the telescope and the remaining gyro and star tracker sensed telescope motion in elevation, up and down. This system hold the telescopy steady despite erratic movement of the gondola as it spined and swayed beneath the balloon. As it was an automatic system, the only way to aim the telescope to a desired point is "to fool" it feeding electrical signals into it. Then the system reacted as this signals were been caused by disturbing motion of the gondola, and responded accordingly, turning the telescope in train and elevation as desired. This was controled by the crew through a control panel. As the experiments performed were devoted to study scintillation, seeing, and interference by absorption of light by water vapor a set of different instruments were coupled to the telescope: a photoelectric photometer, a motion picture camera and a infrared photometer, respectively. They were housed in a compartment mounted on the back of the telescope, on a plate which was rotated to position the particular instrument in the focal plane. The scintillation photometer was similar to those conventionally used for astronomical photometry. A secondary experiment was devised for the photoelectric photometer, to establish the feasibility of obtaining nighttime ozone concentrations and distribution with altitude by monitoring the near ultraviolet radiation from stars. A photomultiplier and filters were used to compare different regions of the spectrum. The filters were mounted in a wheel allowing to rotate them by the observer in such a way that a no filter, open position could be used for observations of scintillation, two broad-band and two narrow-band filters for the ultraviolet observations, and an opaque position for dark current readings. A KD-7 Bell & Howell 16-mm motion picture camera was used for the seeing experiment. An out-of-focus star image was photographed at 12 fps. These photographs were examined for the presence and size of structural detail and the changes therein. 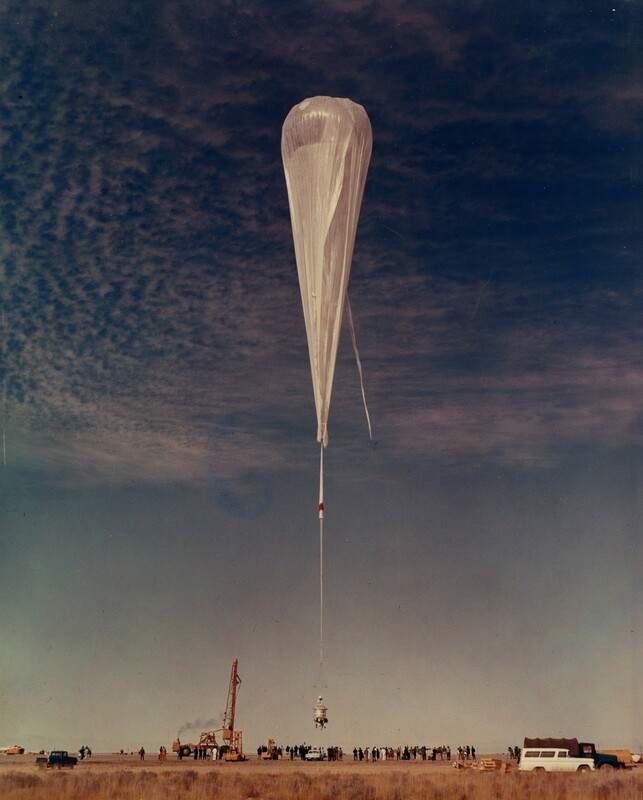 The balloon was launched at 11:30 local time in the morning of 13/12/1962 by vertical method. The ascent rate was about 1100 feet a minute. The all night flight was above 80.000 feet until descent was started at 5:27 in the morning, a bit early than anticipated to prevent a posible landing on the other side of the Mexican border. Total flight time was 18 hours 30 minutes. At landing instead of cutting away from the capsule from the balloon, the pilot maintained the balloon attached in the gondola calculating a mere 12 minutes ov valving period to deflate it. Nevertheless, the wind inflated the balloon and acting as a sail dragged across the ground the capsule and their occupants. 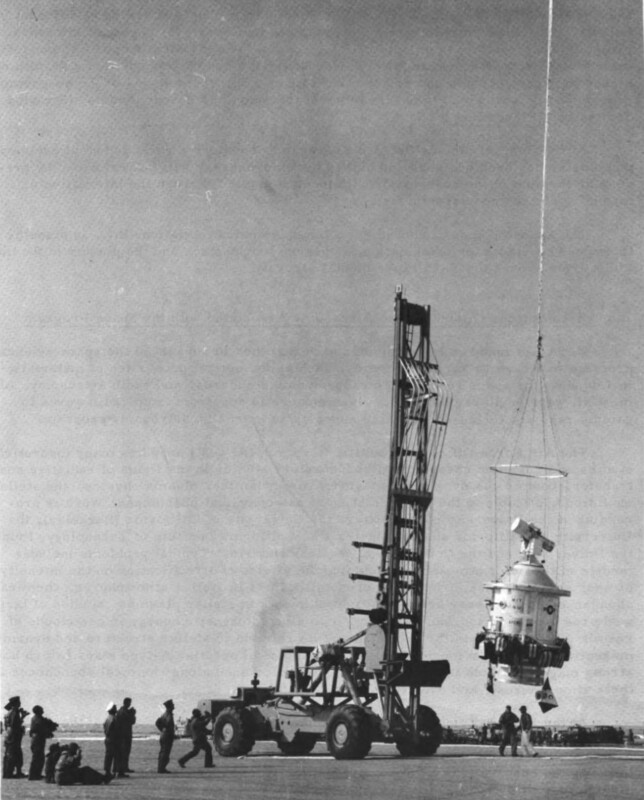 At one point the capsule started turning rapidly so the pilot decided to cut the balloon. About half an hour after the landing an helicopter picked up the crew. This was the first and only flight of the project. It was piloted by Capt. Joseph Kittinger acting as pilot and project engineer and Mr. William White an US navy civilian astronomer as a scientist. The flight was smooth with a minimum of gondola motion. Maximum rotational rates (during ascent and descent) were three degrees per second. During most of the flight period the rate was less than one degree per second. The above was determined by monitoring a standard aircraft compass. Estimates of pendulous motion were obtained from an undamped pendulum which indicated rates of approximately one degree per second. During the nighttime observing period, the gyro-stabilized portion of the stabilization system worked well as evidenced by the ease with which the observer acquired stars on the observing program. Unfortunately, the star tracker which used a photomultiplier as a detector did not work due to high-voltage discharge. 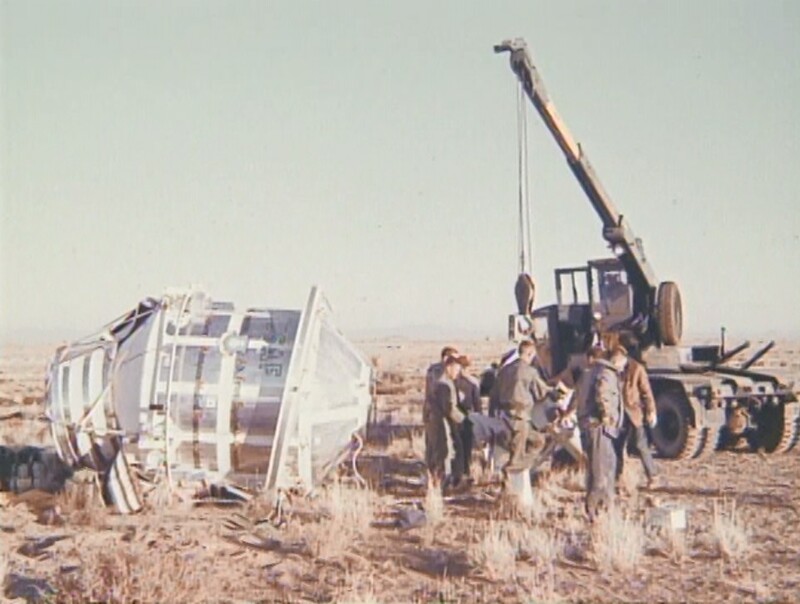 It was later determined that the potting at the base of the photomultiplier had been damaged during transport to the launch site. A similar difficulty appeared in the scintillation photometer. As a consequence of the above only seeing data was obtained. A qualitative comparison of the photographs obtained on the flight with those from the ground indicate that seeing is markedly reduced. The post-flight analysis of the seeing observations obtained in this manner, marked as a possible source of the disturbance the rather larger effective structure of the balloon gondola system. Turbulence could arise through the wind resistance presented by the balloon or through convection around the total structure. The method developed for acquiring stars which were on the program proved very satisfactory. As it turned out on the flight, only a rough estimate of the azimuth direction in which the telescope was pointed was needed. It was only necessary to set the telescope at the proper elevation angle and train the telescope in the direction toward the star until it appeared in the optical link. Several stars (Capella, Aldebaran, Rigel, Betelgeuse, and Sirius) and the planet Jupiter were acquired in this manner. While the 10 deegree field of optical link was fine for acquiring stars, it proved inadequate for guiding the telescope to obtain data with the photometer. During the flight was also examined the temperature distribution with altitude. Assuming a stable and uniform atmosphere over a wide region, elevation angles above the horizon were computed for layers corresponding to temperature minimum and portions of the temperature altitude curves where the temperature was constant over a large change in altitude. In addition to obtaining valuable telescopic observations above the earth, the flight provided valuable information relative to the development of pressure suits and associated life support systems during an extended period on the edge of space. 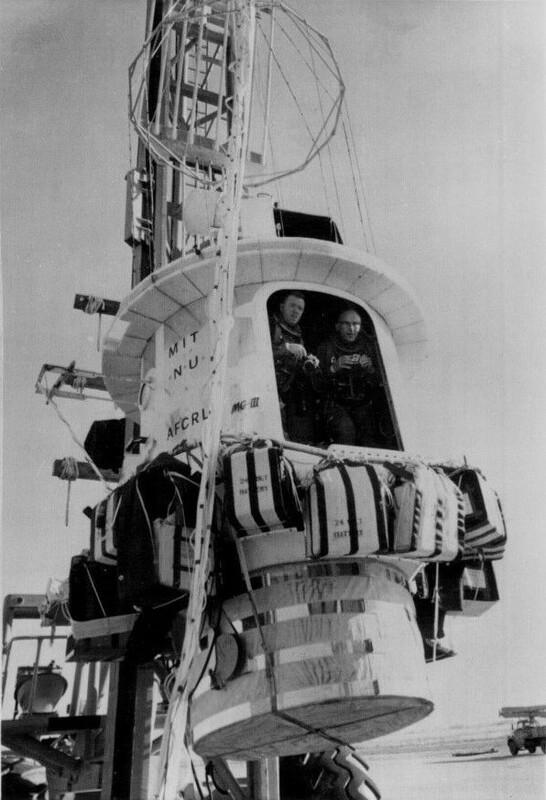 After the flight, it was felt that the experience obtained on it demonstrated that it was entirely possible to construct a balloon borne observatory so the STARGAZER program tried to set a landmark to begin with the application of the concept of an observatory and its functions to high-altitude vehicles. Nevertheless, due to budget shortfalls and equipment difficulties by 1966 the project was finally cancelled with only one flight made of the four originally scheduled. This signaled the end of an era of manned flights. After Stargazer only a few private enterprises turned again to high altitude manned missions.